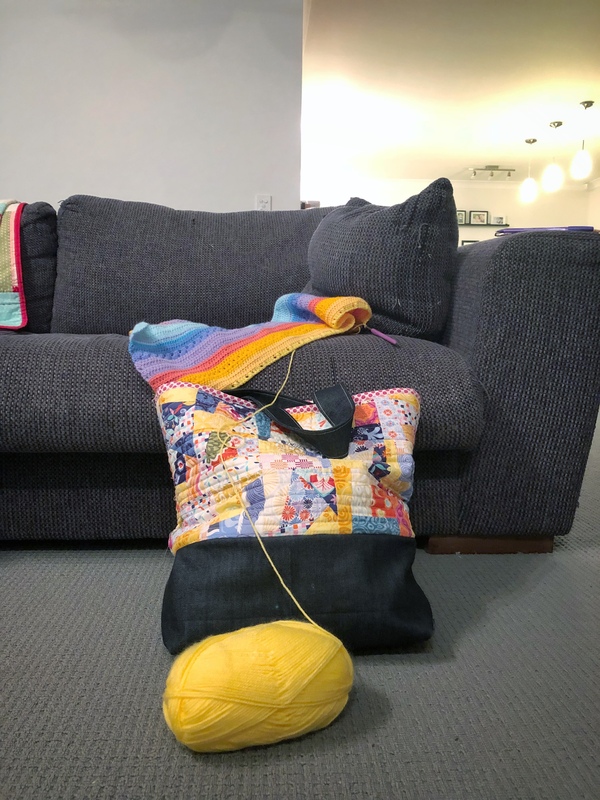 Once I got my arm twisted and was forced to join in on the current Easter challenge, I looked around my newly-sorted and decluttered craft room, and started wondering where the heck I was going to stash a new blanket and 20 balls of yarn. My maker’s tote was already in use to hold my rainbow wave blanket. My yarn box was already full to overflowing. The solution, obviously, was to make a matching project bag. A quick search of Pinterest later, and I was thrilled to discover my colours coordinated well with Kate Spain’s Daydream range. Anyone who’s been around here for any length of time knows I am a massive KS fan, to the point my lovely quilt group made me a gorgeous baby quilt for Beetle, sponsored by AJ‘s KS stash. I started out with pulling some charm squares I had held in stash from the very first Great Aussie Charm Swap all the way back in 2014, and fiddling with the colours. I could get a bit of a mix I was happy with, but it was fairly light on in the yellows, which made up a decent chunk of my chosen yarns. I put out a call on insta for anyone with scraps they were willing to sell, and I was very lucky that one of my sweet followers not only had scraps but was willing to send me what equated to approximately half a fat quarter of a mix of yellows and aquas. The yarn very conveniently arrived from Love Knitting* the day before we were supposed to leave for a road trip to the coast for a family wedding. With fabric arriving Monday, yarn on Wednesday, it seemed Thursday was the perfect chance to get the bag sewn up so I could take the new blanket with me. The downside…we were leaving Thursday night for a Friday wedding. We had a very juggly kind of day as I sewed and set the kids up on the craft room floor to do their schoolwork that I directed with a mouth full of pins. The plan was working beautifully, up until the point Mr Barefoot texted to say he would be home early, and suddenly I had to up the speed to get it done. Originally, my plan for the bag had been to improv some triangles onto squares of denim or linen, but with Trisha’s generous gift, I was able to cut two charm squares from each of the fabrics, and decided instead to go with charm square stack-and-slash improv piecing. And oh my word, did it come up a treat! 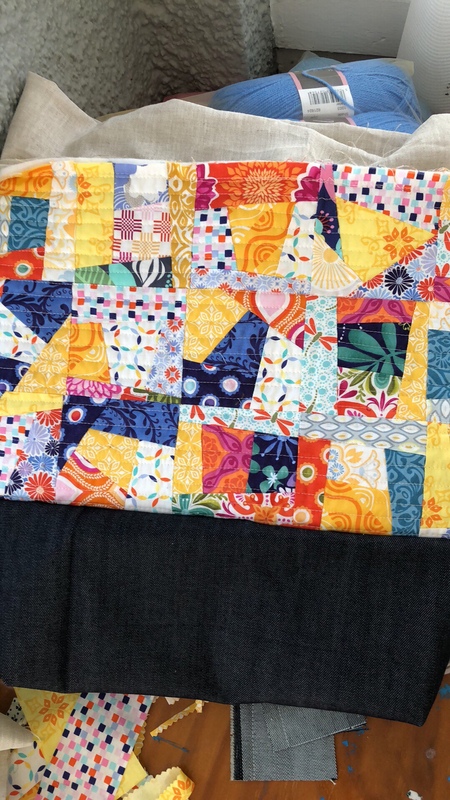 I was super thrilled with it, and even more so once I added the straight line quilting. For the base I used my go-to heavy weight denim, but didn’t add batting, to allow the base to collapse up inside the bag when it it less full. The base is actually 2″ higher than planned after I mucked up the calculations in my haste to get it done. I was frustrated at first, but decided to leave it, as it’s always better to have too much space than not enough! The extra room in the base makes it a generous size, with plenty of room for extra yarn and bit and pieces. And since I’d planned for the base to fold up when not in use anyway, it wasn’t a big drama. Inside the top edge is a linen placket, which is awaiting the addition of some ribbon, to create a drawstring closure for the bag, to protect all the pretty contents inside. You can see a bit of it poking out in the above picture. I just haven’t gotten around to hitting up the shops for the ribbon to do it. The whole bag was then finished off with some denim handles, and binding around the top edge. I ended up using a pink polkadot that I had leftover in stash, from a rainbow picnic quilt I made many moons ago now, and the pink was just the right shade for the rest of the fabrics I had used. The binding I finished off with a zig zag stitch, both for speed, and also strength, especially around the handle areas. Isn’t she pretty? And the colours have worked out perfectly. I am so chuffed by the end result. Now, just to get busy on that crochet blanket! I have fallen a bit behind, as in my ever-graceful way, I managed to slice open a finger over the weekend – said finger being the left index finger that supports my work and has the hook gliding over it, and so I haven’t been able to do as much as I would have liked. The bandaid came off today, however, and I am ready and raring to get stuck into it…with a four day weekend ahead, and a public holiday the week after that, there’s a whole lot of quality crafting in my future!